The Ría de Vigo is an estuary in Galicia, in the North West of Spain. It is the most southern ría of the Rías Baixas. It is located south of the province of Pontevedra and includes several cities: Vigo; Baiona; Nigrán; Redondela; Soutomaior; Vilaboa; Moaña and Cangas with a total population of about 420,000 inhabitants. The Ría de Vigo extends in northeast direction over a length of 35 km from its mouth at Cape Silleiro to the deepest point in Arcade, with a maximum width of 7 km, and is narrowest in the Strait of Rande at 700 m. The Rías of Galicia in general and the Ría the Vigo in particular is a perfect place for the culture of bivalve molluscs. Tidal range is about 4 meters. The water movement is considerable. 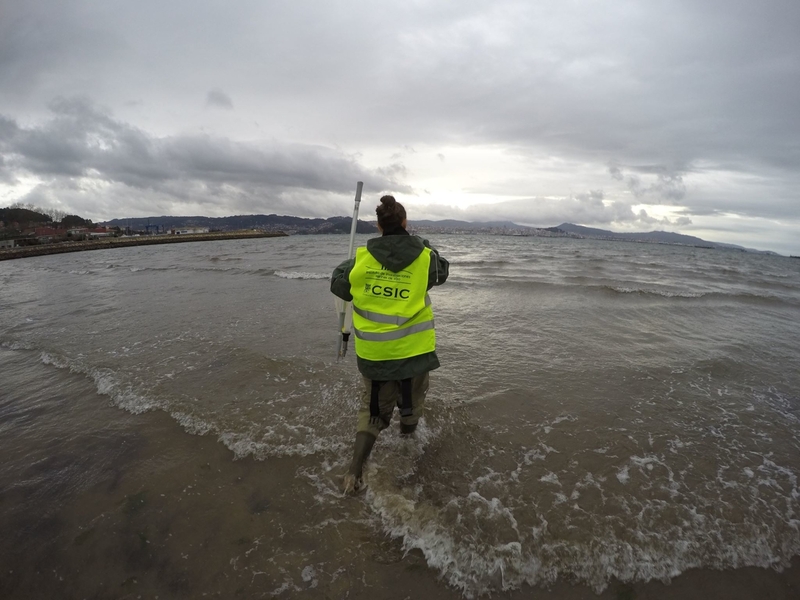 For example, for a 3m tide, the average water flux in the mouth of the ría is about 20,000 m3/s meaning a speed of 10 cm/s. 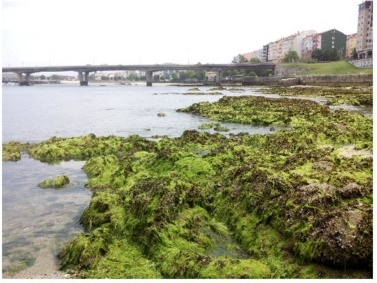 Thermohaline characteristics of the Ría de Vigo change seasonally. In average, in the outer part of the Ría the salinity is 34ppm, and, in the inner part is 23ppm at high tide and 2ppm at low tide. Water temperature varies according to the season and the depth. In summer, temperature is 18ºC at the surface and 13ºC in the bottom. In winter, temperature is 13ºC at the surface and 14ºC in the bottom. Temperature is strongly influenced by the upwelling dynamics. It is interesting that the average water temperature in the whole ría is warmer in winter than in summer because in summer the upwelling frequency is higher. It causes the oceanic water to enter in the ría due to the positive estuarine current. This current comes from depths under 60 meters with average temperatures under 13ºC. On the contrary, in winter, the predominant south winds pushes the surface warm water, with temperatures of 15-16ºC, towards the coast and when it enters in the ría it rises the temperature. Salinity and nutrient content are also conditioned by this phenomenon; nutrients are also influenced by the continental contribution (rivers and rainfall). 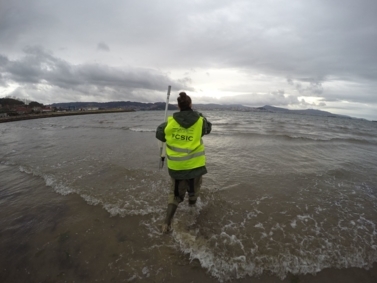 Historically, the Vigo estuary area has been good for fishing and shellfishing, although current conditions are not ideal due to high human and industrial pressure on coastal waterfront. The most cultivated species are mussel and clam but there is also a production of oysters, cockles and scallops (scallop is now under restriction due to ASP toxin). Clam culture in Galicia mainly lies in the seed sowing in natural parks to be restored after the harvesting. Seed is produced in hatcheries until they gain the optimum size to develop on their own in the intertidal sand. Carpet shell clam (Ruditapes decussatus) harvesting started in Galicia in the late 20’s. The lack of regulatory laws contributed to the extinction of the natural populations. The current regulation fixes the amount of carpet shell clam that can be harvested. It has a high market value. Unfortunately, its production is affected by diseases and salinity changes, caused by severe rains. In Galicia, various pathogens (virus, bacteria such as Vibrio alginolyticus or Vibrio splendidus and parasites like haplosporidians and Perkinsus olseni) have been associated with massive mortalities in parks and natural populations, which had affected local Galician economy. Overexploitation and irregular output of local clams, like the carpet shell clam, favored the importation of Manila clam Ruditapes philippinarum to Europe in 1972. Due to its commercial value, Manila clam has subsequently been introduced and permanently established in many areas. After the production in hatcheries, natural reproduction made possible the species settlement along with the natural populations. Manila clam showed more resistance and faster growth than local species. Consequently, nowadays, Manila clam represents the main proportion of clam production. they reach commercial size. According to FAO data, each year 1,500,000 tons of mussels are produced worldwide. Average production in Galicia is around 150,000 and 300,000 tons. Mediterranean mussel (Mytilus galloprovincialis) is a very resistant species to pathogens and severe environmental conditions. Mussel production is very stable and has great value in the local economy. Marteilia refringens and Mytilicola intestinalis are the major pathogens for mussels but none of them have caused severe impact on the production. Currently, the major issues for mussel production are the bio-toxic red tides, which cause enormous economic losses to the mussel farmers. Red tides force the production facilities to close and ban the sale of mussels farmed in the affected areas.